On March 12, 1964, Bi-State Development Agency arranged press showings of its 50 newly purchased air conditioned buses. The new additions to the fleet were supplied by General Motors (40) and Flexible Company (10). The buses were shown to the press at Bi-State’s main shop yard in St. Louis. The new buses were also placed on public display at selected locations around the area. 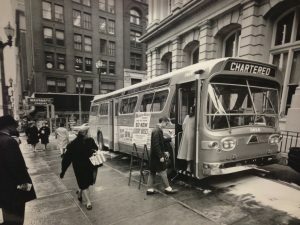 According to the Museum of Transportation, the photo above is one of the new buses at a demonstration point in the heart of Downtown St. Louis. It was displayed right outside of the Old Courthouse. This particular vehicle was visited by nearly 2,000 people in the two days it was on display there. Also in March 1964, the first Ford Mustang rolled off the assembly line at Ford Motor Company and Merv Griffin’s game show Jeopardy! debuted on NBC with Art Fleming as the host.